I’m an absolute sucker for all things novelty t-shirts and North Korea. Put the two together and I’m practically in heaven. Yes, I’m very easy to please. One thing that generally surprises travellers to North Korea is the sheer amount of very unique, cool and kitsch souvenirs to be found. I’m always on the look out for novelty tourist t-shirts and North Korea certainly delivers. Here’s my top 5 t-shirts in high rotation at the moment. An absolute classic. 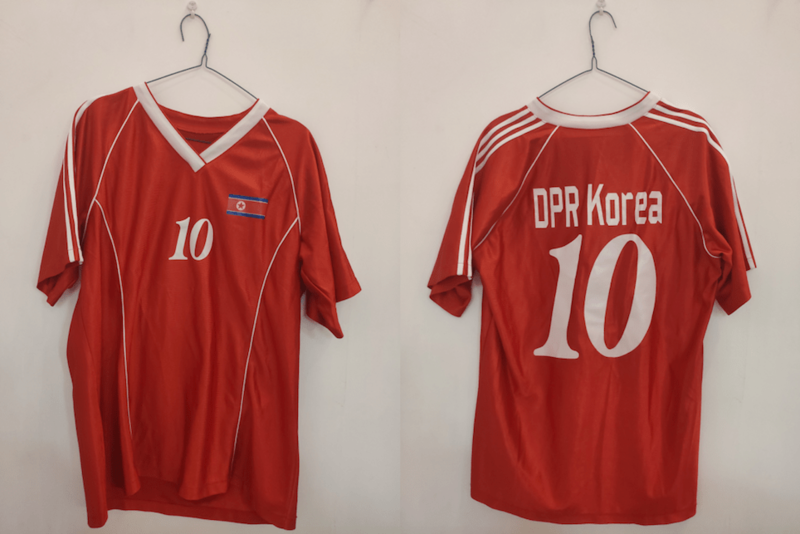 The DPRKorea football jersey. Available only from the souvenir store across from Kim Il Sung Stadium and the Arch of Triumph in Pyongyang, this bad boy’s gotten a few interesting looks at the gym. It’s made of an extremely comfortable synthetic-silky material too and along with the shirt’s matching shorts pretty much act as my “at-home comfort-wear” during the summer. I found this one in the souvenir store at the International Friendship Exhibition at Mt. Myohyang and couldn’t resist. I like the vaguely Expressionism meets Windows 95 Screensaver design and also that it’s one of the more subtly North Korean designs out there with the small Air Koryo logo in the top right corner. 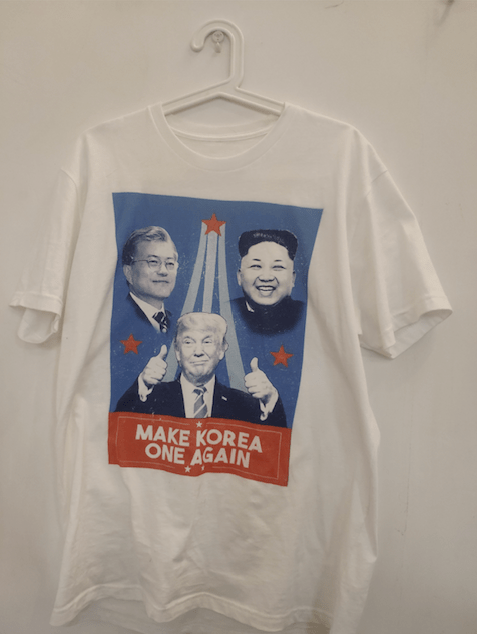 Okay, admittedly not a North Korean purchase, this was available during the recent Singapore Summit and I searched high and low to find somewhere selling it online. Whichever way history goes, I’m treating this one as an investment t-shirt that I’m cellaring away to age like a fine wine. An absolutely classic design that reminds me of a 90’s surf brand t-shirt. 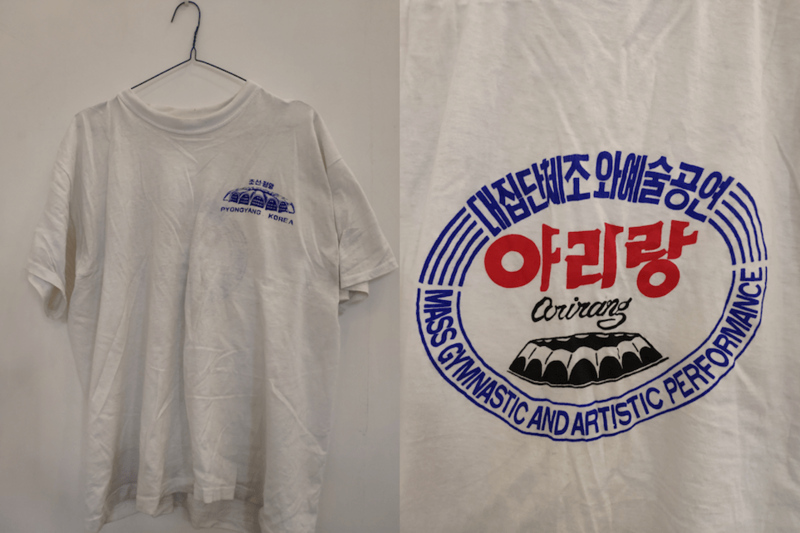 It’s got a little May Day Stadium logo on the front with a bigger Arirang Mass Gymnastic and Artistic Performance logo on the back. The logos appear to be screen printed too which gives this shirt a vintage DIY band feel. Only available at the Arirang Restaurant in Pyongyang. The piece de resistance. 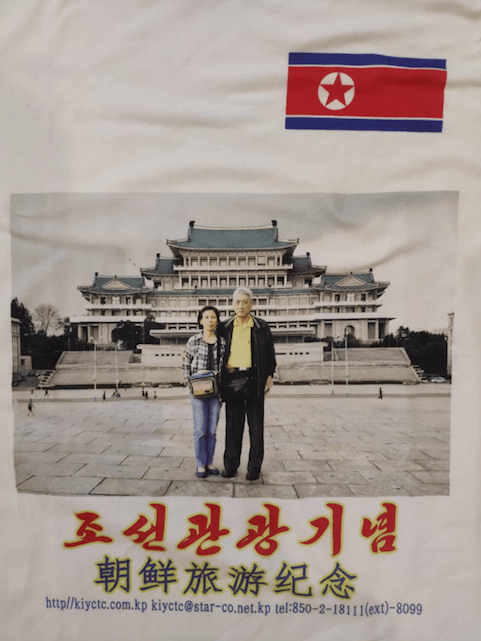 Not only the strangest t-shirt I’ve found in North Korea, but perhaps throughout my entire life as a wearer of t-shirts. Two serious, middle aged Chinese tourists posing in Kim Il Sung Square. Perfect. Granted, this was purchased as a sample product of a personalised t-shirt printing service available and was met with much confusion that I desperately wanted to buy this t-shirt, rather than have my own photo printed on one. 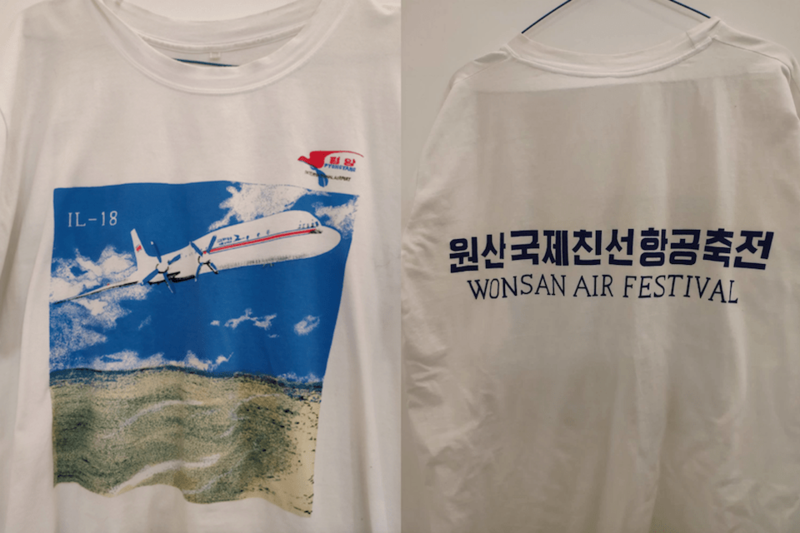 The cherry on top goes to the text which plainly states the t-shirt’s purpose as a “Korean Tourism Souvenir.” Bonus points of course go to the matter-of-fact inclusion of the tour company’s contact details, just in case you need them. But of course, why would you need the contact details when you’ve got our massive list of upcoming group tours available just a click away!